My PhD looks at reconstructing past catchment vegetation around small lakes in the Arctic and assessing the best ways this can be achieved. As the Arctic becomes warmer, a process called “greening” is occurring where plants are migrating northwards into areas they could not previously survive in. It is currently unknown how this migration of plants will affect the carbon cycle. Our NERC-funded project is looking at the role of Lakes in the Arctic Carbon Cycle (LAC) The species composition and carbon-fixing productivity of a lake depends on the vegetation surrounding it. We want to know how lakes will change in response to the shift in vegetation we are starting to see in the Arctic. One of the ways we can do this is by looking at the pollen and plant macrofossils preserved in lake sediment records to determine vegetation changes associated with past climate warming events. Using models such as REVEALS and LOVE (Sugita, 2007) we aim to quantitatively reconstruct the regional and local vegetation. Estimating how much pollen plants produce (Pollen Productivity Estimates, PPEs) is an essential input into these models, however the majority of current estimates are derived from European species. So, last summer Mary, Pete and I headed off to the boreal forests and open tundra of Alaska to obtain the first PPEs from this region. After a couple of days recovering from jet lag and getting all the kit together, we headed off down the Richardson Highway towards the Alaska Range. The first half of the fieldwork focused on collecting samples and modern vegetation data from ten plots in the open tundra, largely along the Denali Highway, south of the Alaska Range. The fieldwork methodology involved collecting moss polster samples which contain around 7-10 years of accumulated pollen. The vegetation coverage was then recorded up to 100m around each sample. This methodology allows us to distance-weight the vegetation around the plot. To test the models and see how they represent the modern vegetation we also collected surface samples from three small lakes we named ourselves; Drop Down Pond, Oh that Pond! and Petty Pond. 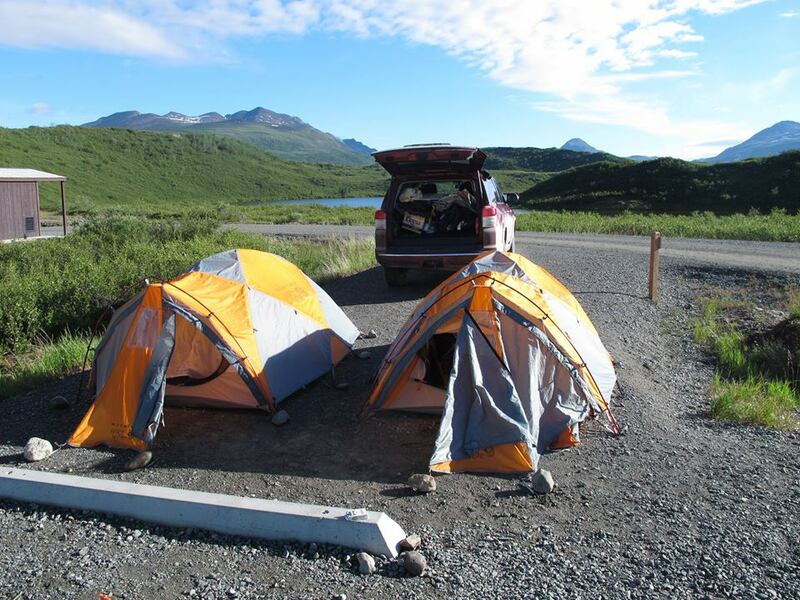 At the end of a hard day’s work we retired to the camp site, surrounded by fantastic views of mountains and lakes, tundra vegetation and topped off by designated gravel camping areas, designed for your comfort! The second half of the fieldwork focused on twelve sites in the boreal forests around Fairbanks. This is where the exhaustion hit me and the mozzies got me! The sites ranged from the beautiful and majestic birch and aspen forests to the dense mature spruce forest which often felt like we were navigating our way through a tangled jungle. Thankfully, we had an extra pair of hands come to the rescue and we were joined by Mary’s friend, Jessie. All this data will eventually be fed into an Extended R-value (ERV) model which will estimate the PPEs for the taxa. At the end of an intense four weeks we had hugged and measured over 800 trees and recorded 691,150.46m2 of vegetation and every mosquito bite was worth it.